After all the 4e hating on D&D forums everywhere, somebody on twitter decided to lighten the mood and start hating 5e early. Speculative hating has to be the greatest invention ever! 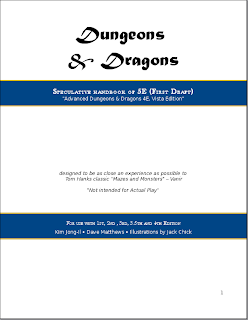 Made me think, wouldn’t it be great to be able to play this 5e everyone was talking about? So I collected all the hate and design a netbook for playing a 5e game, several years before its released! Don’t forget to check out the twitters first though, they work best as oneliners. Edit: New version. Includes power cards and the elusive power gamer monster! Edit: 09/06 Someone made a character sheet for 5e! Yes, even you, devout 1e, 2e, 3e and 3.5e players, can skip right to the vastly superior 5e! Nice. 4th edition is so terrible, that 5th can’t possibly be worse. Right? This is, officially, the awesome. And what’s more – when Wizards of the Coast really do release 5e D&D, we can sue their asses for infringement! Woot! I just want to thank you, because now I can say I have my name published in the credits along with Mike Mearls and Paizo. Why are people making fun of the fact that gamers actually hate a new edition? We have our reasons. Most of us that hated 4E when we first heard about it still do to this day. We’ve played it, seen it in action, and we hate it even more. New editions are pointless. Keep the same edition forever. It’s not hard and it’s not hard to generate new interest. Rules bloat only exists in the mind of the DMs that allow that many rules. 3.5e was the best and will always be. They were being very innovative with it for a long time. Tome of Magic and Tome of Battle, Magic of Incarnum, etc. It’s not hard, honestly. It’s just stupid corporate and they’ll never understand how to do it properly. …and yet they seem to have done 3.5 properly in your mind. 4e is a different system. Some people like it, some don’t. That’s all there has to be to it, no one will force you to play 4e or any other version. Hating an abstract set of rules seems somehow pointless. That’s the issue right there. You hate the new edition without even knowing enough about it to hate about it. That’s what the #ihate5e was satirizing on one level.